Chandigarh: Two medical practitioners in the state are facing 6 months of suspension on the allegation of them acting as ghost faculties with different medical colleges in the same academic year. The suspension had been recommended to the state medical council by MCI, after the two faculties were found acting as ghost medical faculties. NDTV reports that Dr Vijay Kumar Sharda of Government Medical College, Patiala, was found acting as ghost faculty for NC Medical College in Panipat while, Dr Ved Prakash Gupta was found to be acting as ghost faculty in Sri Guru Gobind Singh Tri-centenary Medical College in Gurgaon. MCI rules clearly state that medical faculties cannot be associated with more than one medical college in the same academic year. 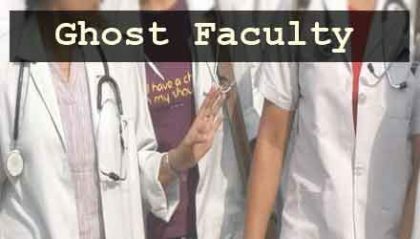 However, over the years, a trend has been growing towards the practice of ghost faculties, where faculties, though not associated with the medical college, show fake associations during the periods of inspection of the medical colleges, in order to enable the medical college show the minimum requirement of faculties and hence get council approval. With the MCI going online with records of faculties and taking stricter measures to crackdown on ghost faculties, the apex body is recommending state medical councils to order immediate suspension of ghost faculties found. Following the direction of MCI, the Punjab Medical Council will remove the name of the faculties from the state medical register for a period of six months, further to which MCI will also remove their names from the national registry of medical practitioners for the said duration. This is not the first time, ghost faculties have been revealed in the state. NDTV adds that the council had found that 166 doctors registered with it were working as ghost faculties in various medical colleges in the region.Four of them had the charges established against them, Dr Grewal, President PMC had said. He had also alleged that Health Education Minister Anil Joshi was protecting them. Corruption is in everyday and every walk of life in India. How can doctors be insulated from it. Medical profession has become not only corrupt but also money hungry, with little or no morals. Writing unnecessary tests, leeping patients in the hospital for extended stay for no reason, ordering unnecessary and unwanted and repeat tests with no indication, asking for commissions, etc. Not only this but also abusing and spreading lies about colleagues and claiming unacquired skills and behaving in an adamant and headstrong fashion are common. Some of medical collages only run by on paper faculty and they does not have any teaching experience but they are present only on MCI inspection day for head count and next day disappear from the collage strict action to be taken against that persons by MCI. The punishment should be removal of name for least five years besides lodging an FIR for false declaration against the faculty as well as Director/ Principal who countersiigned it.